Please click here to learn more about the health benefits (including relevant studies) of regular yogurt and kefir. A tasty vegan yogurt recipe is also listed. Broccoli and other cruciferous vegetables, such as cabbage, kale, brussels sprouts, cauliflower and turnip, are valuable sources of vitamins A, C and E. Broccoli is high in glucosinolates which stimulate the body's immune system. Broccoli also contains a high concentration of sulforaphanes, which are potent anti-cancer agents. Animal studies have shown that DIM -- a chemical produced when vegetables such as broccoli, cabbage and kale are chewed and digested -- can actually stop the growth of certain cancer cells. This spice is found in every yellow curry, and its golden color is the result of curcumin, a polyphenol with strong cold and flu-fighting properties. A 2008 study published in Biochemical and Biophysical Research Communications found that curcumin prevents some immune cells from responding to stimulants and so has modulating and anti-inflammatory effects. Tumeric has antiseptic qualities when applied topically and often is used on cuts and burns. The immune-boosting properties of garlic come from its sulfur-containing compounds, which are effective against bacterial, viral, fungal and parasitic infections; enhance the immune system and have anti-tumor and antioxidant features. This European herb is popular in Mexican and Mediterranean cuisines; and is usually added to flavor spaghetti sauce or pizza. Oregano is one of the most nutritioussubstances on earth, with 42 times more antioxidants than apples, 30 times more than potatoes, 12 times more than oranges and 4 times more than blueberries. This herb has strong anti-bacterial properties, including having shown effectiveness against Pseudomonas aeruginosa and Staphylococcus aureus bacteria. Researchers found oregano to be more effective against Giardia than a commonly used prescription drug. In laboratory studies, oregano has demonstrated stronger anti-oxidant capacity than either of the two synthetic anti-oxidants commonly added to processed food - BHT (butylated hydroxytoluene) and BHA (butylated bydroxyanisole). Bell peppers are a good source of phytochemicals as well as beta carotenes and vitamin C (particularly red bell peppers). Research has shown that increasing vitamin C intake can reduce the length of time cold symptoms last as well as reduce the severity of those symptoms. Tea is rich in plant antioxidants (polyphenols) and other chemicals that can help protect the body against cold or flu. Some studies highlight a compound called epigallocatechin gallate ( EGCG) which have been shown to inhibit the growth of cancer cells without harming healthy tissues. 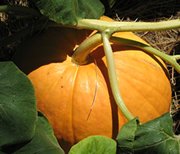 Pumpkins are rich in beta carotene, a nutrient that the body breaksdown to make vitamin A. Vitamin A helps strengthen the immune system and also aids in cancer prevention. Research suggests that vitamin A may help keep the respiratory system healthy, which is particularly helpful when you have a cold or the flu. However, experts caution against too much vitamin A. Because it is fat-soluble, excess vitamin A can be stored in the body's fat cells and large quantities can be toxic. Eating foods naturally rich in beta-carotene may be safer than taking a vitamin A supplements. Ginger is often recommended as a tea or a bath for those with a cold or flu because it is helpful in increasing sweat production, which may help us get rid of germs and toxins. Ginger has also been shown to reduce nausea and vomiting. *Note: Ginger can decrease blood clotting and should not be taken by people with bleeding disorders. Mushrooms (shiitake, maitake and reishi) are remarkable immune boosters - according to Jonny Bowden, Ph.D., C.N.S., author of "The 150 Healthiest Foods on Earth." Not only are they rich in compounds that fortify white blood cells, they also neutralize environmental toxins. In fact, they are used in Asia as an adjunct to chemotherapy. Dr. Bowden also points out that mushrooms lower bad cholesterol and regulate blood sugar. 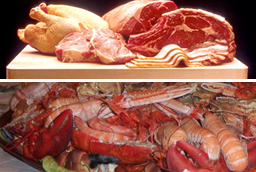 Seafood and lean meats generally have a high zinc content. Zinc enhances the function of helper T cells, which are important in identifying foreign antigens and alerting other cells of the immune system to invaders. Even a mild zinc deficiency can have adverse effects on the immune system, particularly in children and the elderly. But too much zinc can be toxic. Lean meats such as beef, chicken and seafood are the best sources of zinc. Good sources of zinc for vegetarians would be pumpkin seeds, beans and mineral-fortified cereals. Zinc Lozenges: Research conducted at Wayne Stated University in Detroit, lead by Ananda S. Prasad and colleagues, as reported in the August 2000 issue of the Annals of Internal Medicine, yielded following results. Half of 48 cold sufferers were given zinc lozenges and half were given placebos -- identical lozenges with no active ingredients. The zinc group's cold symptoms lasted about 4.5 days. Cold symptoms lasted significantly longer in the group taking placebo lozenges: an average of 8 days. People joined the study within 24 hours of the onset of their cold symptoms, and they were told to take zinc acetate lozenges containing 13 mg of zinc (or placebo lozenges) every 2-3 hours while they were awake. They took no other cold remedies. Coughing lasted an average of 3.1 days in the zinc group and 6.3 days in patients taking the placebo. Nasal discharge lasted an average of 4.1 days in the zinc group and 5.8 days in the placebo group. Study participants also recorded the presence of various potential side effects to zinc treatment, such as dry mouth and constipation. Patients in this study took about 80 mg of elemental zinc each day for four or five days. Generally it is recommended to take 15 mg of zinc for men and 12 mg for women. The participants in this study were taking five times or more of the recommended amount. The authors of the study caution that this was a high dosage given for a short time only. Indiscriminate use of zinc is not advised, and long term (six to eight weeks) use of high-dose lozenges would likely result in copper deficiency and perhaps other adverse effects. They recommend that if cold symptoms do not show improvement after three days of taking zinc, a patient should be examined to see if they have another type of respiratory tract infection or allergies.